Durcor® is the world’s first advanced structural composite piping system designed exclusively to be lined with seamless PTFE. 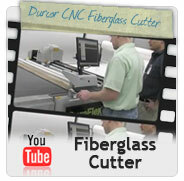 Durcor®’s architecture was optimized from the start, not compromised by conversion. 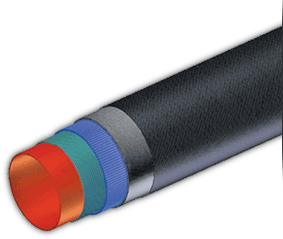 It is the strongest, lightest, most chemically resistant piping system available. Strong, Light Weight, Zero Corrosion. Durcor®’s thick wall PTFE liner provides unmatched internal chemical resistance while its revolutionary vinyl ester / fiberglass housing provides outstanding exterior corrosion protection, high impact resistance and excellent span and burst capabilities. 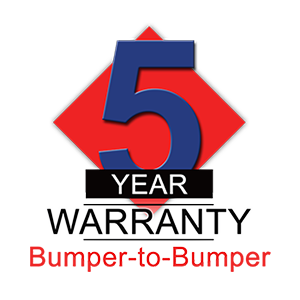 The construction of Durcor® offers the ultimate in physical properties and corrosion resistance and carries the industry’s first (5) year "Bumper-To-Bumper" warranty against environmental corrosion. 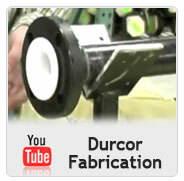 Durcor® is the world’s first composite pipe designed exclusively to support free-standing PTFE fluoropolymer liners. Through a proprietary process, Durcor® pipe is manufactured with glass fiber bundles, pressure saturated with a highly chemical resistant formulation of premium vinyl ester resin to provide maximum exterior protection. The fiberglass bundles are oriented in strict axial and hoop routes which provide outstanding impact, stiffness and pressure capabilities. 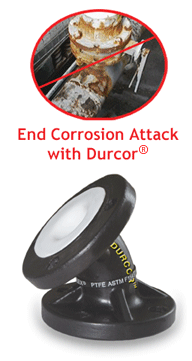 Durcor® is dimensionally equivalent to schedule 40 steel pipe and can be essentially treated the same. Durcor® also has excellent insulating properties and can often eliminate the need for tracing and/or reduced thickness of insulation required to maintain a given temperature. 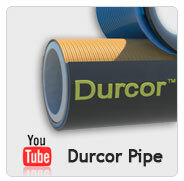 Durcor® piping system should not be confused with dual laminate. Unlike dual laminate fittings & pipe, Durcor® has excellent dimensional control and tolerance as well as outstanding surface quality. Durcor® utilizes thick, seamless PTFE liners that don’t require any chemical or mechanical bonding to composite that could lead to delamination failure. Dual laminate liners typically are made from sheet that are rolled and welded to form geometrical shapes. The nature of the hand lay-up dual laminate process results in parts with inconsistent fiber orientations and resin wet-out. Resin is applied over glass with rollers and excess is removed with squeegees—the process is highly reliant on operator skill. The process typically generates a textured finish on inner surfaces which provide a poor condition for bonding between added layers. The resins need to be low viscosity to be workable by hand, which compromises their mechanical / thermal properties due to the need for high diluents / styrene levels. Porous voids are common in hand lay-up parts and tight dimensional accuracy & smooth surfaces are impossible. Lastly, this technique raises environmental & safety concerns with the amount of volatiles it generates and releases into the atmosphere due to rollers and squeegees being used to apply resin. Contact molding is also another term used for hand lay-up. 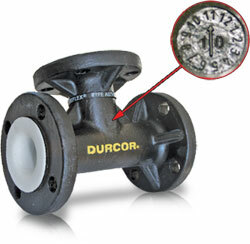 Durcor® PTFE lined fittings are the industry’s first to incorporate a date stamp showing month and year of manufacture for lot traceability. All Durcor® pipe and fittings have an unlimited shelf life.